Practice R Programming questions and answers for interviews, campus placements, online tests, aptitude tests, quizzes and competitive exams. 1. __________ prints out the function call stack after an error occurs. Explanation: traceback() does nothing if there’s no error. trace() Interactive tracing and debugging of calls to a function or method. Explanation: R provides a number of tools to help you with debugging your code. 3. Which of the following is primary tool for debugging? Explanation: Primary tools are mainly used for debugging R code. Explanation: The function call stack is the sequence of functions that was called before the error occurred. Explanation: Once another function is called, you lose the traceback. Explanation: The recover() function can be used to modify the error behavior of R when an error occurs. Explanation: The debug() function initiates an interactive debugger (also known as the “browser” in R) for a function. 8. debug() flags a function for ______ mode in R mode. Explanation: debug() allows you to step through execution of a function one line at a time. 9. What would be the output of the following code ? Explanation: The traceback() function shows you how many levels deep you were when the error occurred. 10. The recover() function will first print out the function call stack when an _______ occurs. Explanation: When you choose a frame number, you will be put in the browse and will have the ability to poke around. 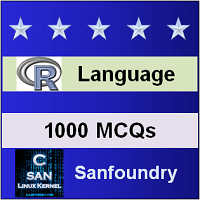 Sanfoundry Global Education & Learning Series – R Programming Language. Here’s the list of Best Reference Books in R Programming Language. To practice R Programming question bank, Here is complete set of 1000+ Multiple Choice Questions and Answers.